During 1950 after many years of research, a dedicated biochemist by the name of Dr. Ernest T. Krebs, Jr., isolated a new vitamin that he numbered B-17 and called ‘Laetrile’. As the years rolled by, thousands became convinced that Krebs had finally found the complete control for all cancers, a conviction that even more people share today. Back in 1950 Ernest Krebs could have had little idea of the hornet’s nest he was about to stir up. The pharmaceutical multinationals, unable to patent or claim exclusive rights to the vitamin, launched a propaganda attack of unprecedented viciousness against B-17, despite the fact that hard proof of its efficiency in controlling all forms of cancer surrounds us in overwhelming abundance. Why has orthodox medicine waged war against this non-drug approach? G. Edward Griffin, author of the book World Without Cancer contends that the answer is to be found not in science, but in politics, and is based upon the hidden economic and power agenda of those who dominate the medical establishment. Each year, thousands of Americans travel to Mexico to receive vitamin B-17 (Laetrile) therapy. They do this because it has been suppressed in the United States. Most of these patients have been told that their cancer is terminal and that they have but a few months to live. Yet, an incredible percentage of them have recovered and they are living normal lives. However, the FDA, the AMA, the American Cancer Society, and the cancer research centres continue to pronounce that Laetrile is fraud and quackery. The recovered patients, they say, either had “spontaneous remissions” or never had cancer in the first place. If any of these people ultimately die after seeking Laetrile, spokesmen of orthodox medicine are quick to proclaim: “You see? Laetrile doesn’t work!” Meanwhile, hundreds of thousands of patients die each year after undergoing surgery, radiation, or chemotherapy, but those treatments continue to be touted as “safe and effective”. In the U.S. the FDA has tried to use strict regulations, not law, to ban vitamin B-17 for over 18 years. 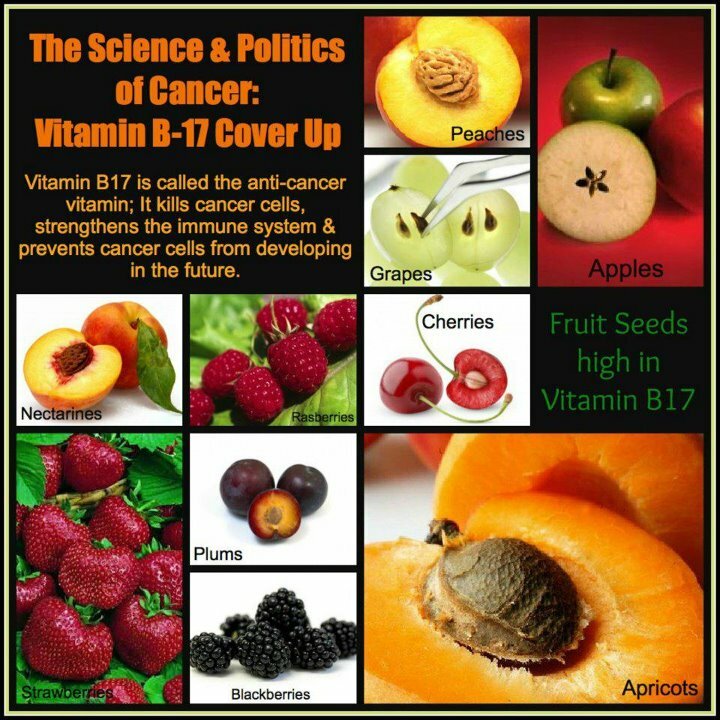 Vitamin B-17, or Laetrile Therapy is only used by some hospitals in Mexico, which treat cancer with nutrition. These hospitals achieve nearly a 100% recovery rate with virgin cases (localised tumours/cancers that have not yet been burned up with radiation, poisoned with chemotherapy, or cut into with surgery). A majority of Laetrile-treated patients report positive responses, ranging from increase in the feeling of well-being and even brighter outlook of life, to such noticeable reactions as an increase in appetite, weight gain and, frequently, restoration of natural colour, reduction or elimination of cancer-connected pain and cancer-caused fetor. In thousands of cases, total regression of all cancer symptoms has been confirmed. The proof Krebs has presented over the years to support his claim is impressive. Centuries ago we used to eat millet bread, rich in B17, but now we chew our way through wheat which has none at all. For generations our grandmothers used to carefully crush the seeds of plums, greengages, cherries, apples, apricots and other members of the botanical family Rosaceae, and diligently mix them with their home made jams and preserves. Grandma probably didn’t know why she was doing it, but the seeds of all these fruits are the most potent source of B17 in the world. In the tropics, large quantities of B17 are found in cassava, also known as tapioca. When did you last eat some? Independent research has also proved that a Himalayan tribe known as the ‘Hunza’ never contract cancer of any kind so long as they stick to their native diet which is exceptionally high in both apricots and millet. However, once exposed to western diets they become as vulnerable as the rest of us. The implications of these findings are staggering of course. If we managed to control Scurvy (vitamin C deficiency) centuries ago, how is it we cannot do the same for cancer today? The fact of the matter is that we could if our respective governments would allow it. Unfortunately most governments have buckled under the pressure exerted by the pharmaceutical multinationals, the American Food & Drug Administration, and the American Medical Association. All three have mounted highly successful ‘scare’ campaigns based on the fact that vitamin B17 contains quantities of ‘deadly’ cyanide; conveniently forgetting that vitamin B12 also contains significant quantities of cyanide, and has long been available in health food shops world-wide. Back in the fifties Dr. Ernst Krebs proved beyond doubt that B17 was completely harmless to humans in the most convincing way possible. After testing the vitamin on animals, he filled a large hypodermic with a mega-dose which he then injected into his own arm! Drastic perhaps, but the adventurous Dr. Krebs is still alive and well today. The vitamin is harmless to healthy tissue for a very simple reason: Each molecule of B17 contains one unit of cyanide, one unit of benzaldehyde and two of glucose (sugar) tightly locked together. In order for the cyanide to become dangerous it is first necessary to ‘unlock’ the molecule to release it, a trick that can only be performed by an enzyme called beta-glucosidase. This enzyme is present all over the body in minute quantities, but in huge quantities (up to 100 times as high) at cancerous tumor sites. But what about danger to the rest of the body’s cells? Another enzyme, Rhodanese, always present in larger quantities than the unlocking enzyme beta-glucosidase in healthy tissues has the easy ability to completely break down both cyanide and benzaldehyde into beneficial body products. Predictably perhaps, malignant cancer cells contain no Rhodanese at all, leaving them completely at the mercy of the cyanide and benzaldehyde. Any physician reading this article will probably be shaking with self-righteous indignation at this stage, muttering to himself: ‘Yes, but where is the PROOF???’. Wisely perhaps, Griffin notes that because of the adverse publicity against B17 Laetrile, and because of the difficulties in obtaining the ‘banned’ substance, most cancer sufferers turn to the vitamin as a last resort, long after they have been burned by radiation therapy, and/or poisoned by chemotherapy. He points out that once the body organs have been savagely damaged in this way, there is little if any chance of B17 Laetrile being able to effect a cure. The body is simply too far gone.